Rocket Salad with Pears Pine Nuts Pancetta and Dolcelatte is one of the easy and delicious salad recipes which one can enjoy to make. This is because the salad has ingredients like pear, rocket, pancetta, balsamic vinegar, pine nuts and others, combining together to produce a great taste. 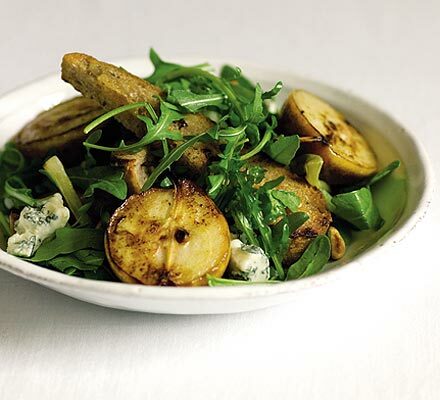 Moreover, Rocket Salad with Pears Pine Nuts Pancetta and Dolcelatte is a fabulous ‘go to’ dish when your guests drop in suddenly since it is quick to prepare and has a taste which makes people ask for that ‘special’ ingredient. Aside from its amazing taste, Rocket Salad with Pears Pine Nuts Pancetta and Dolcelatte also looks really fancy when it is finished with dressing. You can try it too by following its simple recipe given in this guide for your assistance. Take all the ingredients of the salad and toss them together gently after which transfer them to a serving bowl. Then, place all the ingredients of dressing into a salad dressing container or shaker. Cover the salad dressing container or shaker and shake all the ingredients for roughly 20 seconds or until the oil gets blended. Now mix the dressing and mixture in the serving bowl. The salad is now ready to be served!